The 500 yen coin used in Japan is one of the world’s largest coin denominations in terms of monetary value (its rival being the Swiss 5 franc coin). I’ve lost count of the number of times I thought I was totally broke on the street, only to find enough coins in my pocket to buy dinner several times over. Receiving a 500 yen coin as change always brings a smile to my face as I know that somehow, someday this coin will come in handy when I least expect it. To showcase the handiness of the 500 yen coin, here is a list of things you can do with that one coin. Ok, I know, not exactly very creative here. Oh did you realise that I said ‘four’ and not ‘five’? That’s because 100-yen shops actually sell items for 108 yen each (the addition being sales tax). That leaves us 40 yen short of getting a fifth item. The typical 100 yen (or hyaku-en) shop sells household goods, cutlery, stationery, dried food and the likes. The most well-known chain is probably Daiso, but there are other chains such as Can-Do which can be found in almost everywhere. Apart from these shops, there is also the Lawson Store 100. Besides the typical stuff found in 100-yen shops, you can also find groceries, frozen food, fresh fruits and vegetables at Lawson Store 100. Since it is technically a convenience store, Lawson Store 1000 shops are usually open 24/7, which is ideal for the busy and broke chef. 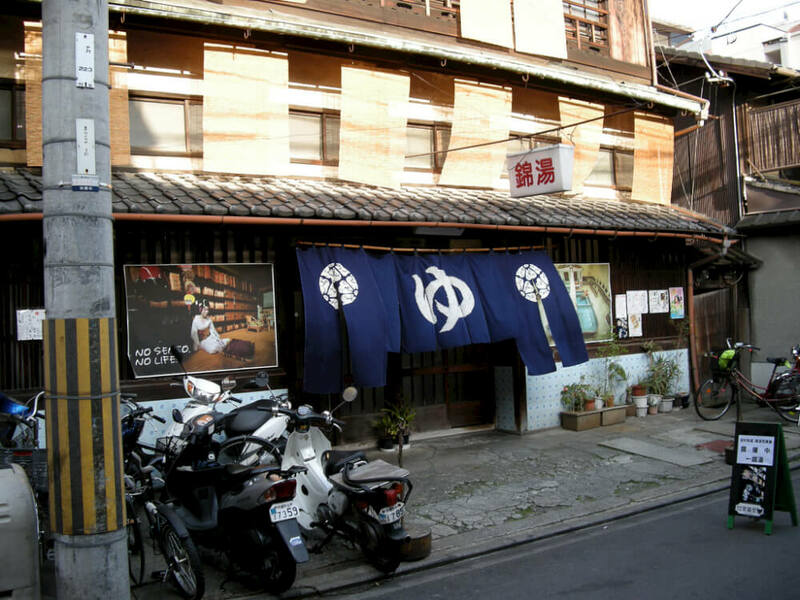 A sentou can be considered the little brother of an onsen (hot spring bath). While similar in layout and concept to onsens, sentous do not usually use spring water for the bath water and are thus more affordable. Essentially, they are public baths with heated water. While many retain a traditional look, it is not uncommon to find ‘modern’ sentous at the ground floor of office buildings in the middle of a busy urban area. Sentous are priced at 450 yen across Tokyo, hence entering this list comfortably. In many shrines and temples, you can get your fortune told by drawing lots (omikuji). This is often done a device that randomly produces a lot number (such as a hexagonal box). You will then open the corresponding drawer to get a slip that tells of good or bad fortune. In the case of a bad lot, you can simply roll up the slip and tie it to a nearby branch or fence (it will be immediately obvious). Technically, you are supposed to tie it to a pine tree (松 – matsu) due to it being a homophone of 待つ (to wait), hence ‘postponing’ the bad luck that would befall you. 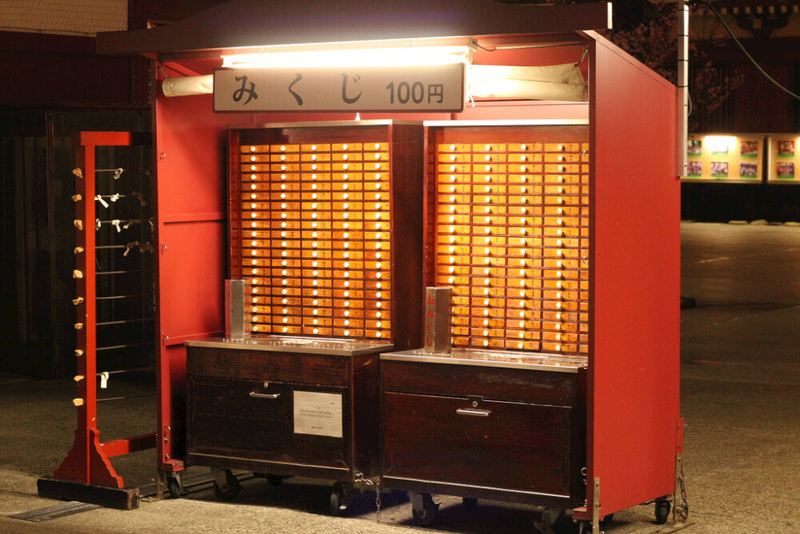 Omikuji stalls are often based on integrity (no one checks if you actually pay). You can put your 500-yen to good use all at once, or break it up at a 100 yen shop and use the change sparingly at every temple/shrine you come across. An omikuji stall. Photo credits: FunkBrothers (CC License).